How would you feel if one of your deceased family members suddenly walked through the door? The reaction of a family in Mahamodara, Galle was a mix of happiness and horror when suddenly their loved one who was thought to be dead, walked in through the front door, while his funeral arrangements were been made. 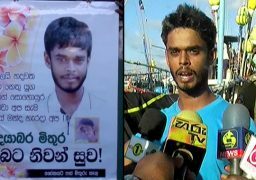 Ishan Manjula, a 21-year-old fisherman from Mahamodara who was thought to have drowned at sea walked home to witness grieving relatives and banners and posters announcing his death. It later transpired that Manjula’s purported death was due to a mishap involving a phone call. Last Saturday, a 22-year-old youth named Sajith Madusanka had died at sea after his boat collided with another fishing vessel. The news of his demise had been conveyed to officials ashore by phone call. However, instead of Madusanka’s name it was Manjula’s name which had been mentioned, The miscommunication had led to relatives making arrangements to hold Manjula’s funeral. However, Manjula who was thought to have died returned home yesterday alive and well while Madusanka’s body was handed over to the hospital for a post mortem.